Gum disease, also known as periodontal disease, is incredibly common: more than half of people in the U.S. have it. Unfortunately, many people who have it aren’t taking the proper steps to reverse its damage and stop its progression. The most important step to fighting gum disease is regular visits to your dentist for a cleaning. When you have gum disease, it’s important that you see your dentist in Manahawkin every three months to fight the progression of the disease. We may need one of our dental hygienists to perform scaling on your teeth, which is essentially a deep clean. After that, simple cleanings should be sufficient to help fight plaque build-up, provided that you are abiding by the two other important steps to take. The first is to practice proper dental hygiene by brushing twice daily and flossing once daily. The next is to eat a diet that supports your gum health. CoQ10. This is an antioxidant found in the body that plays an important role in cell function. There is research that suggests that people with adequate CoQ10 have a lesser risk of developing gum disease. CoQ10 may also suppress the inflammation of the gums in people with periodontal disease. Collagen. Collagen is the building block of tissues in our bodies, and gum tissue is no exception. Gum disease degrades the collagen in the gums, so it’s important to get enough collagen in your diet. Catechins. Catechins are antioxidants and phenols that fight disease. Studies have shown catechins to be effective in inhibiting the growth of bacteria in the mouth. Vitamin C. There is a correlation between low vitamin C levels and gum disease. Increasing your vitamin C intake may aid your immune system in fighting against gum disease. Vitamin C also plays an integral role in collagen maturation. Beta Carotene. According to research, people with gum disease may heal better when they eat diets high in beta-carotene. Omega-3s. Omega-3s are important for reducing inflammation in the body and supporting a healthy immune system. One study correlated omega-3 intake with lower risk of gum disease. So all that being said, what should you eat to get these nutrients? Certain nuts and seeds, such as pistachios, macadamia nuts, and sesame seeds, are high in omega-3s. Try snacking on some macadamia nuts or sprinkling sesame seeds on top of your stir fry. Salmon is also an excellent source of omega-3s. If you aren’t a fan of salmon, any oily fish will due, such as herring or mackerel. Glazed salmon is delicious: try mixing a combination of honey, soy sauce, garlic, and ginger and marinating your salmon in it before baking it in the oven. Grass-fed beef is an excellent source of collagen. In addition, it is high in omega-3s. The one caveat? It’s very important that it is only grass-fed — grain-fed beef contains inflammatory properties that counteract the benefits of collagen. You may have luck finding grass-fed beef at your local farmers market. Chicken is a great way to get both CoQ10 and collagen in your diet. In particular, chicken skin is high in collagen, so make a point not to take it off when you’re eating it. In prehistoric times, humans ate the entirety of the animal; nowadays, we don’t, which means we are missing out on some great sources of collagen. Bone broth is one way we can get the collagen from the bones of the animal that we no longer get in our modern diets. Broccoli is a delicious source of vitamin C. On top of that, broccoli provides magnesium, iron, calcium, vitamin B1, and selenium, so broccoli is a wonderful addition to any diet. Bell peppers are a wonderful source of vitamin C — in fact, one cup of red bell peppers contains more than 300 percent of your daily recommended value of vitamin C — more vitamin C than an orange! 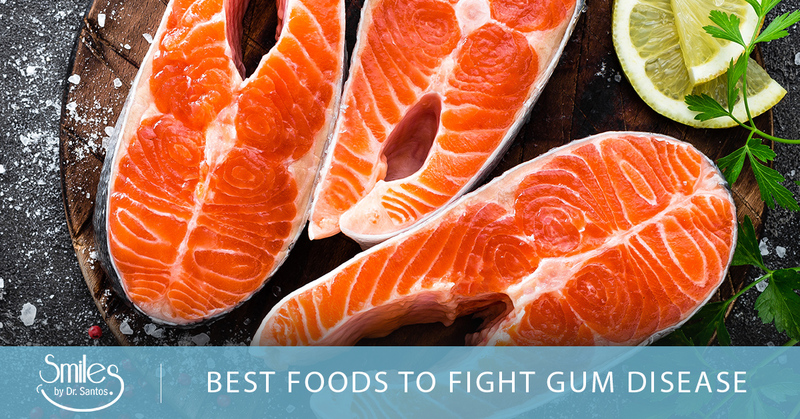 We hope these tasty foods help support your gum health. When you’re looking for a dentist in Manahawkin, contact us!